Here in cable-less land, when you want to watch the Oscars and your digital tuner/antenna only picks up Fox, Spanish television, and something called Cozi TV (? ), you have to get creative. My roommate and I battled the antenna for an hour, with ABC flickering on occasionally then going back to the dreaded blue screen. 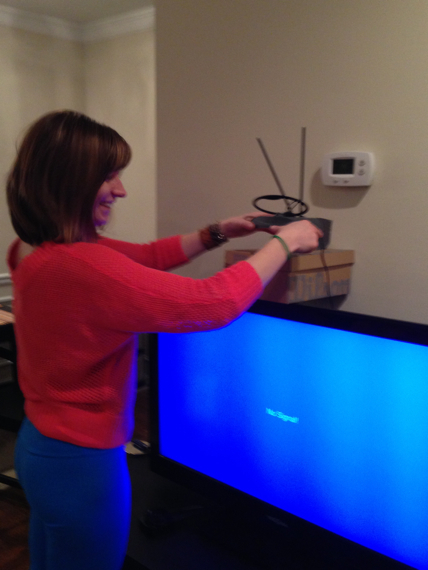 Googling didn't help at first: the advice we found included "try adjusting the placement of the antenna." Doy. That must've been click bait. But a very high-tech solution of aluminum foil plus a box duct taped to the wall actually worked! And just in time, when the show was about to start and we had given up hope. What did you think, if you watched? I realize now that I will never watch any live, national event on television without also scanning Twitter, and I don't know how I feel about that. My personal Twittersphere hated Seth and thought he was the height of misogyny, but I follow a lot of feminists. Everyone's Twitter echo chamber is different, I suppose. His whole hosting schtick was so meta. And no one's dress really stood out to me. But 2012 was an amazing year for movies. Judging from the previews I've seen recently, I don't know if I'm optimistic for 2013. Spring Breakers, I'm looking at you. And every movie set in the future about aliens invading the earth. There are a lot of them. I just saw Side Effects though and really enjoyed it. It's a corkscrew of a plot, and some fine performances. Back to our living room: should we keep the jerry-rigged box situation? Or just get cable already. Posted in Books and Movies. February 25, 2013 by Adele Chapin.